A pre-mixed compact of skin beauty aids in a single white dry powder form. The effective skin whitening for dark skin or areas of dark skin - sunburn, thus preventing the formation of freckles, birthmarks, pimples and blackheads, prickly heat that gives baby skin results. No pre-washing needed. Economical and easy to apply. I have high hopes with Etta's Bleaching Powder because of the raves I see in girltalk. How good can this powder really be? I gave in and ordered my Etta's online. It was not easily available in stores before. I also bought Etta's Mixing Solution for the mix sold separately. It is mentioned that we can use milk in place of the mixing solution though. Etta's Mixing Solution is 10 V Hydrogen Peroxide which can also used to lighten/bleach hair. The bleaching powder is a finely milled plain white powder. It has no scent and the texture is the same with flour. One box contains 112 grams of product divided to 2 separate bags. Put (1 tablespoon for face/ 4 tablespoon for body) Etta's powder in a bowl. Mix powder with the Hydrogen Peroxide until ice cream appearance is produced. Apply on desired area. Wait until it dries and wash with plenty of water. Upon application you will feel your skin tighten, somehow itchy but do not fret as this is normal. I used Etta's Bleaching Powder hoping that it will even out my skin tone. However I didn't noticed any changes. I followed the schedule as hard as I can but I still didn't seen effects. Cheap whitening regimen. It's only P180/ box and P30 for the Mixing Solution both available in Mercury Drug stores nationwide. Messy routine and not for busy people. You can't walk around when you use this product as the powder will fly around and you'll leave white mess on your floor. No ingredient list for the bleaching powder. I'm curious to know what whitening regimen do you have now sisses? when nyo po ba ginagamit ang etta's? before or after bath? Hi Anon! I personally use Etta's Bleaching Powder before taking a bath pero I use mild soap na lang after then lotion. Hope that helps! Hello Anon! Aww~ Too bad it didn't worked for you too. Another bleaching product I guess you were referring to is white henna and soap chips. I have seen this product being sold in Hortaleza. Personally, when I had an uneven skintone before I have used green peeling oil and bleaching cream/lotion to even it out. It takes days,not a totally safe and usual way to whiten but it worked for me. Hi. Saang online shop po kayo bumili? I bought mine from Shenelles online shop in sulit. I haven't checked pa if they are still selling those though. This product has became more accessible na since it is already available nationwide in Mercury Drug stores and Hortaleza outlets. No actually this is a really old post before it was deleted and I had to repost it. 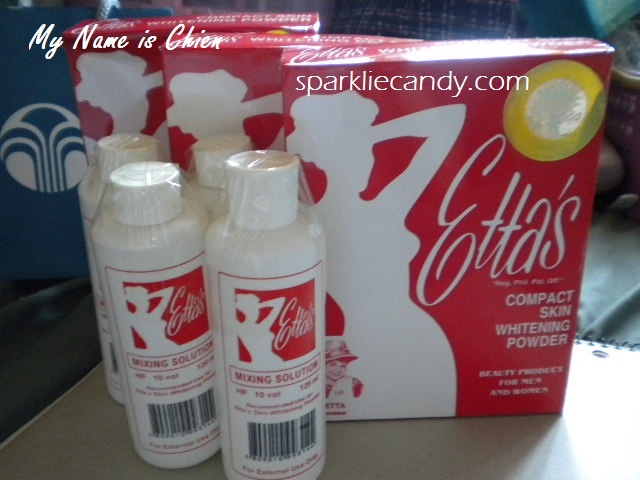 This is the old Ettas packaging talaga so it is legit. Thank you for your concern Anon! and btw product is accessible na sa Mercury drug outlets so less hassle na sa online shopping. Saan po b mkakabili ng ettas bleaching powder? Hi chien ok lng ba kung evap? so meaning to say hindi pala maganda ang etta's i want to try pa naman.. ung buhok lang ng skin mo ang magbabago pero pano ung skin mo? walang effect? Hi everyone! I would like to share my experience with Ettas. I've been a user of this for almost 4years na and I can 101% say na tested and proven siya para sa akin. Sipag at tiyaga lang talaga ang kailangan. Nag e-ettas ako 24/7, and YES! pumuti talaga ako. I used to apply it on my arms, elbows, knees, legs, and some darker parts of my skin. Tama yung procedure ng pag gamit sa nakalagay above. But instead of using a 10 VOLUME Hydrogen Peroxide Solution ay 20 VOLUME yung ginagamit ko to level up the intensity and yung effect. And still, may epekto talaga. First to notice talaga sasabay sa pagpuputi ang hairs ng balat, well thats normal kase nga sa taas ng volume ng solution. What I do is that, shinishave ko nlg sila para sabihing di ako nag eettas at natural yung pagkaputi ko. Yung discouraging lang e medyo mabaho lang siya at makate pero tolerable naman. Hope this would also helps! God Bless everyone. Hi! Safe ba kung magdamag nakababad armpit sa ettas? Is that what you did? hi.gumagamit din ako ng ettas 2 years ago and pumuti talaga ako ng husto..lahat ng procedure sinunod ko..sadly,lagi na ako naaarawan kaya tinigil ko na ang paggamit ..pero effective talaga tong pampaputi..beware lang kayo sa mga fake.. I also want to try etta's sa sat.ko balak magstart sa HORTALEZA merun naman binibenta nun. At wait. May nakapagsabi kase saken na mas okay kung hahaluan ng CALAMANSI ang etta's at isabay sa halo ng powder at nung solution. Okay ba yun? Etta's lalagyan ng Calalamansi at ihahalo kasama ang solution? Okay lang ba a haluan ng calamansi yun? How to apply sa mga nKaTRY na at SUBOK na talaga. Pls. Help me too. I want to be more pretty like you guys! So pls. Help me! :) or maybe you can text me. Hi. Yep okay lang din haloan ng clamansi pero 2 piraso lang po ha at mas mabuti gamitin na hydrogen peroxide (Rhea Agua Oxinada) ay yung color blue. Ettas user ako since 2009, maintain lng tlga at tiyaga. isang bottle ba 10 volume na un? Nakakadry sya sa una so kelangan talaga imoisturise but I see the results after! Hiyangan din, sa iba mabilis, instant effect kita agad sa tuhod, sa kin pinamabilis makita ung effect sa face. I now became a distributor (dahil tested ko na ung products, especially the soaps) so in case you got curious, I'm in Instagram, thebeauthashop_pasaycity. Mention that you saw this post so I can give discounts (wink). effective talaga siya kaso need mo lang talaga ng tiyaga sa pag apply ng etta's & time consuming talaga siya kasi need mo pang hintayin na magdry sa balat mo tska mo siya babanlawan. pero to tell you honestly effective xa, sa divisoria un mga Chinese drugstore nagbebenta sila 130/box. Matagal na sa market itong Ettas. Effective talaga, need lang mag tyaga. Nakita ko po ang Ettas sa Lazada, may COD pa sila. Very convenient para sakin bumili. How to identify if it is authentic or fake? Bawal po ba mag pa araw pag nag bleach? Bawal ba ma arawan pag nag bleach? hello guys: try po ninyo ang lotion de beaute.yan po ang gamit ko.the best po.u can see the changes of your skin in just 3-7days. lotion de beaute & soap de beaute..
Totoo ang ettas kasi nung time na ng aral ako sa tesda yung trainor nmin ang ganda ng kutis makinis na makisap at ang puti nya pantay tinanong nmin sikreto nya kung ano ginagamit nya, yun nga ang sabi ettas..pero iba ksi yung sa knya my halong ingredients try nga nmin sa school eh.. Drink at least 3 liters of water every day and you will get extraordinary results on your skin complexion and texture. Water is an all rounder remedy when it comes to skin. Not whole month or a year, just try this for 10 days. This product is not effective.I keep on using for it for how many months but nothibg happen. :-(my friend also use it but it also wont work on her. I am patient in waiting for the result.I follow the instructions but nothing happen.Its really not effective. hi there.. are you sure it's not effective to your skin? how you apply ettas. you should wait 30minute till it dry then rinse your skin. hi there guys, i was 16 when I use ettas bleaching powder. at tlga po magaling mgpa light tlga ng skin. at hndi po fake Ang ettas. I can buy it at hortaleza or mercury. madalas out of stuck kc marami gumagamit nyan. ma's effective pa sa gluta if you don't have to wait months to see the light result Ang ettas after mo e apply makikita Mona Ang result p.o..
this is base on my experience sa ettas. no fake ettas p.o.. at sure na kaka-puti sya ng skin.